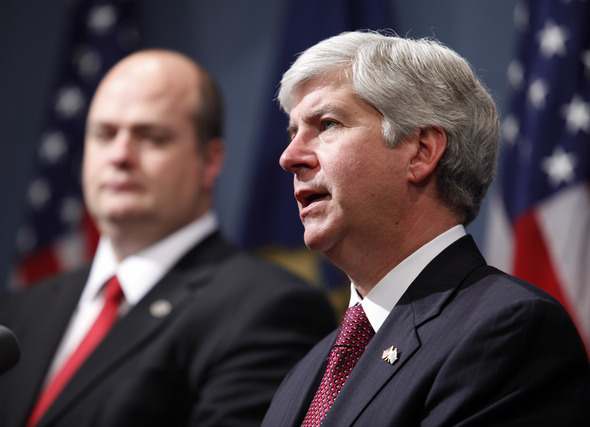 Posted on Fri, Feb 10, 2012 : 5:58 a.m.
Michigan Gov. Rick Snyder, right, talks about his budget proposal during a news conference, Thursday, Feb. 9, 2012, in Lansing, Mich. At left is state budget director John Nixon. Michigan's 15 public universities will likely be getting more money next year, but not as much as they had hoped. Gov. Rick Snyder wants to restore $36.2 million to higher education during the 2012-2013 fiscal year, he told lawmakers in Lansing Thursday morning as he unveiled his desired budget. If the proposed budget is approved by the Legislature, public universities will receive approximately $1.4 billion of the state's $48.2 billion 2012-2013 budget. That's a 3 percent increase from fiscal 2011-2012, but still a fragment of what appropriations were a decade ago, education advocates say. "We welcome any additional funds after a decade-long trend of disinvestment," said Michael A. Boulus, executive director of the Presidents Council State Universities of Michigan. “You have to put this in perspective," he continued. "It’s $36 million in one-time-only money and it pales in comparison to the amount of money we’ve lost over the last decade and frankly last year." The proposed $36.2 million increase is roughly three-fourths of the $47.5 million decrease the University of Michigan alone experienced in fiscal 2012. That year, Michigan's 15 state universities were awarded $1.36 billion, roughly $216 million less than the 2010-2011 allotment of $1.58 billion. The average 15 percent decrease was a blow to universities and put Michigan in the bottom 20 percent of states in per capita higher education funding. "We need more resources to support our students here," Eastern Michigan University President Susan Martin said in an interview Thursday. State appropriations constitute approximately 22 percent of the school's operating budget. About 20 years ago, state funds comprised 70 percent. ”The removal of that has led to a deterioration of some of our academic buildings, our residence halls and it has affected our ability to attract faculty and students," Martin said. At EMU, the decrease also caused a dramatic reliance on tuition revenue. About 75 percent of EMU's 2010-2011 general fund came from tuition revenue. For the first time in state history, a portion of state appropriations —the $36.2 million increase— will be tied to four performance indicators, Snyder proposed Thursday. Benchmarks include high completion rates, the amount of students gaining degrees in "critical skill areas," the number of Pell Grant recipients attending the institution and tuition restraint. In his proposal, Snyder set next year's tuition restraint benchmark at 4 percent, steeper than the benchmark issued in 2011-2012 when the state threatened to cut funding 22 percent (instead of 15 percent) for schools that increased tuition more than 7 percent. The incentive approach, dubbed formula funding by many, has been controversial among education advocates. On Thursday U-M Vice President for Government Relations Cynthia Wilbanks said the formula funding model, as proposed by Snyder, is "very focused on undergraduate outcome," echoing a view expressed by the Board of Regents in November. She said Snyder's metrics do not account for the success and progress of U-M's graduate programs, which instruct nearly 16,000 students. "That also stimulate(s) and helps to support the economic diversification of the state," she said. Snyder is recommending that EMU in 2012-2013 receive a 2.3 percent funding increase. He wants the Ypsilanti school to receive $64.6 million in operating funding and $1.5 million in performance-based funding. The governor has recommended U-M's Ann Arbor campus receive a 1.4 percent hike, meaning $268.8 million in operating revenue and $3.9 million in performance-based funding. A return to appropriation heydays? Martin said that while she understands the need for Michigan to balance its budget in a recovering economy, she's hopeful for a greater increase next year. "This is going to be a conservative budget," she said. "But there is really a need for public support to help families pay for college.... It's becoming overwhelming for people to deal with the cost so we need federal and state support to reinvest in higher education." Another increase, however, is not included in Snyder's second-year forecast regarding fiscal 2014. Wilbanks said that doesn't bode well for a full restoration of the near-35 percent in state funds that have been eliminated from U-M's budget since 2002. "It’s a tall order to think about a return to the high watermark of appropriations, at least at the University of Michigan," she said. "The climb back, if you will, is challenging." Sun, Feb 12, 2012 : 3:55 p.m.
&quot;We need more resources to support our students here,&quot; Eastern Michigan University President Susan Martin said in an interview Thursday. Hardly! Susan Martin needs to lower some of the exorbitant salaries in place by most of the EMU administration and some of the EMU staff. How about annarbor.com FOIA EMU regarding its latest raises for administrators? Sat, Feb 11, 2012 : 4:04 a.m.
And Sparty Michigan has the 12th highest total cost for a student, when state funding, federal funding, tuition, fees and other income for the colleges are added together. This according to the College Board's own report, which the UofM helped write. So, while the state may not be giving huge amounts, and that is a problem, the schools are doing little or nothing to manage costs. OBTW - this is across all of the 4 year universities in Michigan, not just the UofM. I will not out where the UofM is in total cost for public universities in the good ole USA. Sat, Feb 11, 2012 : 1:42 p.m. Sat, Feb 11, 2012 : 5:29 a.m.
Have you seen a drop in student applications or admissions due to high tuition, fees, etc? Or is the international reputation of UM worth maintaining and building instead of tearing it down and treating it like a worthless sinking hole of $. Sat, Feb 11, 2012 : 5:24 a.m.
12th highest cost, I'd have to see the data you claim .... Ranked in the top ten, academically DonBee? Would you agree? Has tuition met the Governors line in the sand? Have cuts of 35% been made from its State appropriations in ten years? Have benefit and retirement cuts been made across the board? Have energy/sustainability improvements been made saving millions? What do you know of cost savings initiatives at UM over the last ten years, DonBee? Fri, Feb 10, 2012 : 7:32 p.m.
Last year's &quot;average 15 percent decrease was a blow to universities and put Michigan in the bottom 20 percent of states in per capita higher education funding.&quot; 80% of States received more higher education funding than Michigan. 80% of States valued higher education more than Michigan does. UM receives the largest knocks, but it is the one of the nation's premier research universities, employs more people in Washtenaw County than the next 24 employers combined, and is unimaginably complex given it's educational, research, health system, and patent programs involved, let alone the 40,000+ students attending each year. Let the armchair clueless yammer on. Fri, Feb 10, 2012 : 3:15 p.m. I'm glad to hear that President Martin is acknowledging the negative affects academics has endured with inadequate funding. How does she reconcile this reality with her continued support and funding of athletics (especially the football program albatross). Priorities are really screwed up. Sparty, As one &quot;in the know&quot;, I'm sure you know that President Martin is the President of EMU, not UM, of which the original post was about. EMU's football does not make millions for the football program nor does it fund all capital projects, pay salaries and more. In fact, the program is a huge financial loss for the university which has to continually subsidize through student fees while academics continue to suffer as noted by President Martin in the article. Thanks for trying to set me straight however. Fri, Feb 10, 2012 : 7:35 p.m.
She doesn't fund athletics --- it's a separate budget that makes millions for their program, and funds all of their capital projects, pays their salaries, and more. Clearly you are not in &quot;the know&quot;. Fri, Feb 10, 2012 : 3:09 p.m.
How is being skeptical news? I've hardly met any politician who didn't make me skeptical in my lifetime. Fri, Feb 10, 2012 : 3:02 p.m. So U of M is receiving $6600 per student from the state, plus they charge an arm and a leg and it's still not enough? Maybe they should look around at the rest of the people in the State of Michigan and SHUT UP!!! I'm a Michigan alumni but I'm sick of the pampered overpaid administrators whining. SHUT UP SHUT UP SHUT UP! None of us want to hear you whine, not our Republican governor or our Democrat president. You've united us in one cause. UM administrators SHUT UP! Fri, Feb 10, 2012 : 2:50 p.m. Thank heaven we never politicize anything. Ops, must be more then two people competing for something. Would that be money or power? Hard to tell. What has been obvious for several generations that higher education has had no limit on it's rising cost to students. When the business school Profs make a lot of their income outside the University one has to wonder where their real interest lies. This is the same school who preaches monetary disiciplane. Apparently that is not worthy lesson for the institution they work for? The bigger, the better, the more students, and success of the students the more pay for the administration and if I worked there I would be part of the same procedure. Higher education has never had a decrease in tution. The economy has been up &amp; down; but higher education has never suffered real cost cutting across the board. So, is it the Governor or the mechanism of the instition? I beleive the insitution is fighting an obvious atempt to limit their ability torun the place as they have seen fit. pretty normal reaction; but are they really fighting for the students? I think not. I think the Governor is fighting for the economic prosperity of the State. In case we forget that's us who pays the bills. Our educational system needs more work at the elementary school &amp; high school level then Higher education. Instead of giving all this money back to the university administrators with no strings attached, why not bring back the Promise Scholarship in some form (under a different name obviously) and give the money directly to the students to help offset their ridiculous tuition costs? Not only are these young people graduating and/or dropping out with enormous amounts of student debt, but they face the highest unemployment rates by age group. Fri, Feb 10, 2012 : 1:58 p.m. I have read about how Gov. Snyder has slashed education budgets since taking office and now I read &quot;a 3 percent increase from fiscal 2011-2012, but still a fragment of what appropriations were a decade ago&quot; Has Snyder been Governor for a decade? Fri, Feb 10, 2012 : 3:18 p.m.
Fair point - if you want to focus on just him, how about just this? Since Gov Snyder has been in office, with this proposed budget, he will have cut higher education spending by $180 million (a decrease of over 11%) in two years. That should make the universities feel better. Fri, Feb 10, 2012 : 12:58 p.m. In addition to not being able to control cost (which Eastern is trying to do and is actually the only one), the graduation rate at Eastern is 12% in 4 years and 24% in 6 years (2007). So, when does Eastern takes responsibility for graduating students and getting them jobs? If this is just an enrichment program at EMU, then maybe you should change the name from a university to a &quot;program&quot; and get rid of half of the staff. What are all those people doing that work there if they are not helping students to actually finish college. Snyder's commitment seems to be educating our state and apparently that means a 4 year degrees in 4 years. So, 76% of your students and their families are spending their savings and going into debt for classes and enrichment for a better life but do not get any certification. SHAME ON YOU EMU!!! Sat, Feb 11, 2012 : 2:52 a.m. Yes, I taught there and there were several children who did not have that capability of succeeding there. First, do not let them in and steal their money. Yes, students need to earn it, but if you are not going to deliver college graduates, then you are an enrichment program and really do not professors doing research. Why do you have all those people doing research when your kids are not graduating. Embarrassing. If every professor and staff member at that school adopted a student and were paid a commission if they graduated, then they would graduate. The focus is wrong. Fri, Feb 10, 2012 : 2:35 p.m.
Just because a student goes to college does NOT mean they are entitled to graduate. They still have to earn it. EMU is long known for opening access to a college education for those who might otherwise not have the chance for one. With that comes the high risk of low graduation rates. Fri, Feb 10, 2012 : 12:43 p.m.
EMU has done a good job lately with holding the line on tuition increases. UM has not. I doubt both the long term and short term committment of President Coleman or the Board of Regents on controlling their budgets. Fri, Feb 10, 2012 : 7:37 p.m.
Actually UM did meet the Governor's goal on tuition increases last year as well. To what do you refer ? Fri, Feb 10, 2012 : 3:21 p.m.
EMU also missed its enrollment target last year, while U of M is turning potential students away in droves. There's a lot more in selecting a college than tuition. I don't like the fact U of M's tuition has increased markedly either, but it makes sense - there are literally tens of thousands of people who are clamoring to get in, which argues that even at today's prices, they've underpriced. Fri, Feb 10, 2012 : 12:24 p.m.
lets split this faculty up into teachers and researchers.teachers spend minimum 32 hours a week in the classroom and get paid the most because colleges are suppose to be educational institutions.deans and department heads TEACH in the classroom 30 hours a week and administrate for 10 hours. since researchers aren't teaching their pay is bottom of the scale except for all the Executive VP'S and the PLAIN OLD VP'S who are really in charge of nothing.these clowns get 1/2 of what the LOWEST paid researcher gets. the high command gets paid at a level SLIGHTLY above the level of the VP'S and gets evaluated EVERY 6 months by the TEACHERS. Fri, Feb 10, 2012 : 7:22 p.m.
Do you know or even understand the meaning of a national research university ? Fri, Feb 10, 2012 : 12:20 p.m. Given the intellectual desert of political correctness, the free pass for binge drinking, the importance of palace building over teaching, and the inability to hold tuition increases close to the inflation rate, I doubt the commitment of the university administrators to higher education. I guess in their criticism of the Governor, they've never heard of projection. diplomacy aside what they really mean is they don't like their share of the pie. furthermore can you really trust ANYTHING Snyder or any other politician says? Fri, Feb 10, 2012 : 12:23 p.m.
Fri, Feb 10, 2012 : 11:58 a.m.
UM gave a 6-digit raise to the dean of engineering and enormous raises to multiple others. Most faculty make egregious salaries for teaching the exact same course material over and over and having graders, GSIs, or lecturers do all their &quot;tough&quot; work. Then, they run their own businesses on the side that are aligned with their research activities at the university and somehow this is all deemed acceptable. If you want to evaluate where the money is being sunk in higher education, start with the top of the organization and work your way down. Fri, Feb 10, 2012 : 11:29 a.m. Even President Obama has issues with the rate of increase in the total costs universities have. It is not state or federal money reduction that is the issue. It is the rate at which universities seem to be able to spend money. Cost controls, better budget allocation and cost containment are needed. As to commitment to higher education and more money, retirement commitments to state employees, retiree health care benefits, unfunded federal mandates and other federal requirements have to come first, Michigan has no choice in that. One example, brought out be numerous articles here on cost containment - University Police/Public Safety departments. Do they really need to be separate entities, or could that be handled by the county sheriff's department. Right now both EMU and the UofM are expecting to pay more for a director of public safety than the county pays the sheriff. Maybe if they drop the positions, consolidate their public safety with the sheriff, and work as a single department, we will not read about issues like happened at the hospital anymore and save money at the same time. I am sure others can find dozens of other ideas.